Now that you have a cochlear implant should you wear some sort of medical alert identification in case of an emergency? The most important precaution when you have a cochlear implant is to avoid MRIs unless the proper steps have been taken. For some implants and countries, that means removing the internal magnet with a local anesthetic (leaving the implant in place), doing the MRI with a compression bandage, and then replacing the magnet with a new, sterile magnet. Some implants don’t require magnet removal, but a compression bandage is still required. Low-strength MRI machines may make the logistics easier. But low-strength machines aren’t very common, and the image quality is not as good. A main concern is that you may be given an MRI in an emergency situation, and that the high magnetic field strength may damage the magnet or even cause the implant to shift. Based on information received from paramedics, emergency room physicians, and radiologists, the chance of receiving an MRI while unconscious is remote. While cochlear implants are still somewhat uncommon, there are many other types of metal implants, and even the occasional bit of metal or shrapnel that may be in the body. Unresponsive or unreliable patients are examined for potential implants, and are also given head and chest X-Rays, as recommended in these illustrative MRI guidelines. The American College of Radiology maintains a Guidance Document on MR Safe Practices which covers topics such as MR suite layout, access to various magnetic zones by staff, patients, and maintenance personnel, as well as examination of unresponsive patients. Because of this, no patient is given an MRI unless it can be verified that the procedure will be safe. In emergency situations, X-Rays and CT scans are much faster, and are usually the preferred choice. These procedures are perfectly safe to have with a cochlear implant. It is always helpful if you can communicate your medical situation and conditions to a caregiver. Some conditions may make that difficult in certain situations, and that is where medical ID can be invaluable. For example, knowing that an unresponsive patient is diabetic may facilitate rapid diagnosis and treatment. 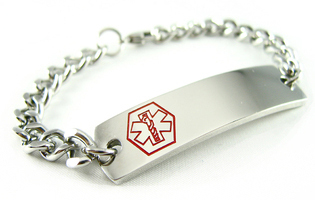 The better medical ID devices, such as bracelets, necklaces, or dog tags, include contact information to a company that maintains your relevant medical information corresponding to a unique identification number. These allow for more information than can fit on a piece of jewelry, and provide a higher level of confidence that the information is in fact correct. This service is provided for a nominal fee. 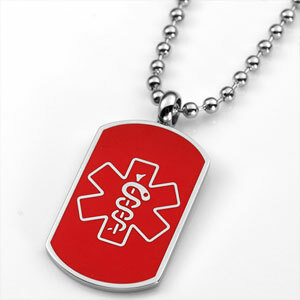 There is no standard for what a medical ID should look like, but the most recognizable are metal bracelets, necklaces, or dog tags with a caduceus (left), often in red. You can also purchase a silicone bracelet, runner’s ID, or various handcrafted pieces of jewelry to hold your information. But less conventional medical ID may be overlooked as a piece of jewelry. Emergency responders are trained to look for medical ID. Some responders take pride in being able to find medical ID no matter what it looks like, while others recommend sticking with conventional medical ID styles for the best level of recognition. Cochlear implant manufacturers do not specifically instruct recipients to wear medical ID. Cochlear Implant HELP has not identified a requirement to wear medical ID if the only information is that you have a cochlear implant. 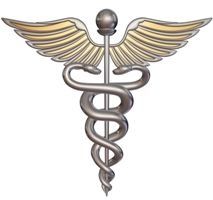 However, if you are going to wear medical ID, it should be easily recognizable as such.